"Marco Rubio wants to deport me!" one man yelled during a wave of protests that broke out at the Jack Kemp Foundation's forum in South Carolina, where several Republican candidates gathered to discuss ideas for fighting poverty. Other pro-immigrant demonstrators voicing various chants -- including shouts of "undocumented and unafraid" and "Rubio doesn't represent our community" -- crashed the summit six times, cutting in on a panel featuring the Florida senator and Ohio Gov. John Kasich. 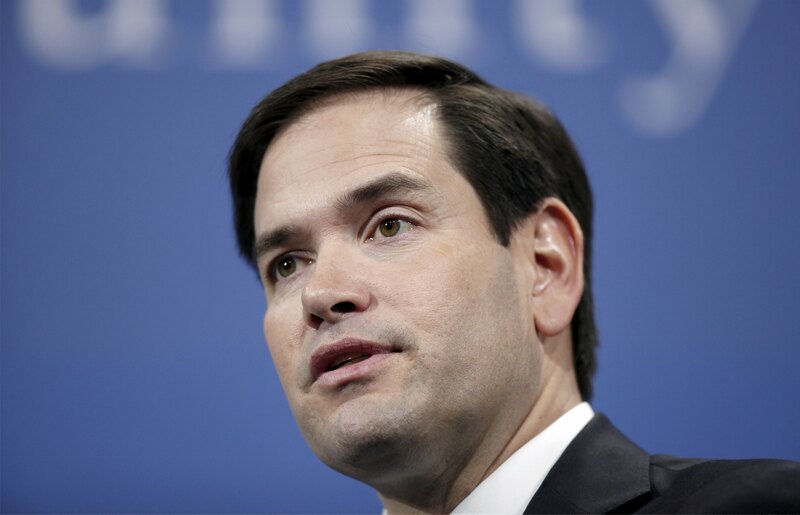 Throughout the 2016 campaign cycle, Rubio has been criticized for his shifting immigration views -- both from conservatives who favor a harder line on deporting undocumented immigrants and from others who champion a pathway to citizenship. In November, Rubio proposed ending the Deferred Action for Childhood Arrivals (DACA) program, a 2012 policy that protected from deportation anyone under the age of 16 who entered the country illegally. The Cuban-American senator brushed off the protests Saturday, laughing and jokingly suggesting that the activists "do it when Kasich speaks," instead of interrupting only during his comments. Security officers escorted the protesters out of the venue without issues. According to the activists, up to 16 people arrived at the event to confront Rubio. The demonstration was launched as a joint effort between pro-immigrant groups United We Dream and Young Immigrants in Action for South Carolina. After the second wave of protesters, Rubio ribbed that he "thought about handling them the way another candidate does, but it's not my event." Rubio seemed to be alluding to Donald Trump, who has been criticized for his tough handling of protesters at campaign rallies. On Friday, protesters at a Trump rally were ejected from the crowd while the GOP front-runner spoke about Syrian refugees and the possibility that they were members of the terror organization ISIS. One Muslim woman, wearing a hijab and a shirt that read "Salam, I come in peace," attracted further attention after she was escorted out of the South Carolina venue when she stood in silent protest. Trump supporters reportedly yelled "get out" as police removed her from the space. Kasich weighed in after the immigration demonstrators interrupted the Jack Kemp forum Saturday, mentioning that he had seen on television a crowd booing a female protester at a rally -- presumably in reference to Trump's South Carolina campaign stop. "That is not the Republican Party," the Ohio governor said. "We are not the type to not tolerate differences ... that's not the spirit of Jack Kemp." CBS News' Sean Gallitz and Donald Judd contributed to this report.